Want noise cancellation in a pocket-sized package? Sony’s noise-canceling true wireless headphones are on sale for $158 today, which is $2 less than we saw on Black Friday, and an all-time low. They don’t have the best battery life, so you can’t use them continuously all day at work, but their included charging case makes it easy to top them off. And hey, they’re freaking noise-cancelling truly wireless earbuds. That’s amazing! Sony’s noise-canceling over-ears are also available for $298 right now, if you missed them yesterday. Wi-Fi range extenders can’t work miracles, but if there’s one spot in your house with spotty coverage, they can be a much cheaper solution than buying a new router. So at $21, why not give this one a try? Just clip the $5 coupon to get the deal at checkout. Anker’s SoundCore speakers have been so popular, SoundCore became its own brand name. One of the first products under the new livery is the SoundCore Motion Q, which packs in dual 8W drivers (compared to 6W on the standard SoundCore speakers), 360 degree sound, an attractive fabric exterior, IPX7 waterproofing, and even the ability to sync two together for stereo sound. The Motion Q has sold for $50 since it launched, but today, you can get it for $40, no code required. My favorite feature though? The included Harmony Hub that turns your smartphones, Echoes, and Google Homes into fully-functional remotes; perfect for when you’ve inevitably lost the actual remote in the couch cushions. $250's a pretty penny, but it’s within $10 of the best price Amazon’s ever offered. What gift do you get for the gadget lover who already has everything? A bag to carry their gadgets, of course. The Zero Grid Electronics Travel Organizer is bursting with pockets, straps, and zippers to keep all of your tech gear organized and untangled while you’re on the road. Get it for an all-time low $17 today with code LQLRQ6CQ. Look, I get it, you don’t think you need an endoscope. And you probably don’t! At least right now. But the day will come—it could be in a week, it could be in 10 years—when you’ll need a snake-like camera to look down a drain, or in the recesses of a car engine, or inside your air conditioning ducts, and you’ll be glad you bought one for $20 with code X53L9VCY. Dr. Meter’s Wi-Fi endoscope is a 720p camera with built-in LED headlights at the end of a five-meter, semi-rigid cable. At the other end of the cord is a Wi-Fi module that that broadcasts live video to your phone or computer, so you see what the camera sees. It also comes with three attachments (a hook, a magnet, and a mirror) that you can slip onto the end to peer around corners, or retrieve tiny items. At this point, I feel like I should cover my bases and point out that this is not a medical device. Please, don’t put it inside yourself or anyone else. Otherwise, have fun. Thanks. Replacing a hard drive with an SSD is one of the most worthwhile upgrades you perform on a computer, and Samsung’s 860 EVO is one of the best drives out there. The 1TB model is currently marked down to an all-time low $250, so go ahead and treat yourself. It’s not one of Vizio’s high-end displays with HDR, but this 50" 4K TV is only $300 today, and includes some nice touches like four HDMI ports, built-in Chromecast, and the ability to control it with your smartphone or a Google Home smart speaker. Alexa is better with a screen, and you can grab Amazon’s excellent Echo Show for an all-time low $150 today. You don’t have to buy two of them for this deal, and it’s not refurbished: This is just a straight-up $80 discount. If you’re all in on the Google ecosystem, you can put two more Google Home Mini smart speakers in your house for $58 today, courtesy of Walmart. That’s the best deal we’ve seen on these since Black Friday, and not bad considering they usually sell for $49 each, or $39 if there’s a sale going on. A 10' charging cable is one of the best things you can buy for yourself, and this nylon-wrapped PowerLine+ cable is on sale for $13 today with promo code ANKER823, in the color of your choice. These cables include an 18 month warranty, feel great in the hand, and are durable enough to be gobbled up by a Roomba...I speak from experience. Sony’s WH1000XM2s put the noise-canceling headphone world on notice when they were released last year, and now, you now they’re back on sale for $50 off. They’re still an investment at $298, but if you spend any significant amount of time in planes, trains, or just a noisy office, they’ll probably be the best thing you buy this year. This low profile Bluetooth keyboard can pair to up to three devices at once, and even includes a device stand, making it ideal for using with your phone or tablet at a coffee shop or on a plane. You can’t beat that for $10 with promo code KINJA3. Notice anything weird about those speakers? Look on top. Yes, they have upward-firing drivers in addition to forward firing, making them perfect for a Dolby Atmos setup, and they’re only $200 for the pair today. While 5.1 or 7.1 surround sound involves placing speakers around your room on a single plane, the concept behind Dolby Atmos audio is to give audio an element of height. If you don’t want to install speakers in your ceiling though, speakers like these can achieve a similar effect with a lot less work, assuming you have an Atmos-compatible receiver to run them. Whether your current mouse is giving you chronic wrist pain, or you just want to try something different, this 4.2 star rated wireless ergonomic vertical mouse from Anker is only $14 today with promo code ANKER987. In addition to the clever design, it even comes with three adjustable DPI settings and forward/back buttons, which are pretty rare at this price level. You can also save an extra $2 by opting for the wired model, with promo code ANKER98A. Update: This promotion was scheduled to end on May 31, but they extended it to June 8. Once this deal does go away, I can’t imagine we’ll see a better Apple TV deal for a very long time. When you cook with olive oil, you have three choices: You can pour imprecisely, you can make a measuring spoon dirty, or you can use Vremi’s $13 olive oil dispenser, which measures out a precise amount of oil before you pour it. I know which one I would choose. Today’s price matches the best we’ve ever seen. Our readers have bought thousands of Yi’s home security cameras, and today, you can get a panning and tilting model for $35 with code TXNQ9QV8. The markers are permanent, but the deal is not. Hurry and grab these 36 fine point black Sharpies at their historic-low price of $11. 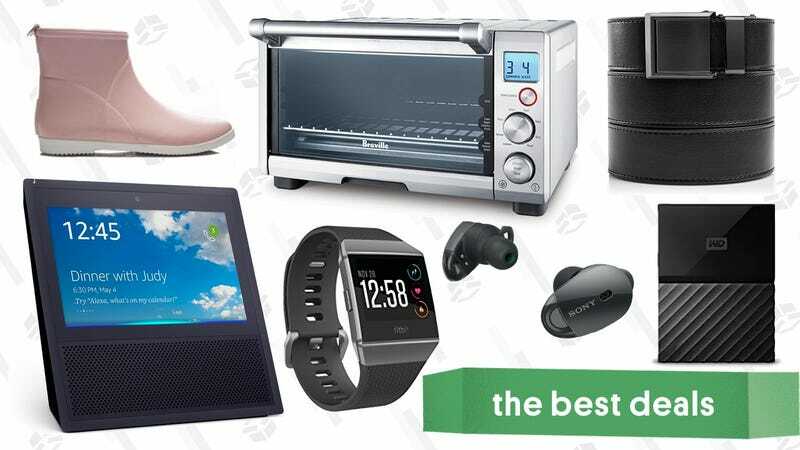 Typically selling around $175+, you can start cooking in the of our readers’ favorite toaster oven, the Breville the Compact Smart Oven for $129, while supplies last. Today’s price is the cheapest it’s been since Black Friday, so if you’ve been thinking about it, now’s a good time to pull the trigger. Update: There are only a few days left in this campaign, and they just added more earlybird rewards, so preorder now to save. 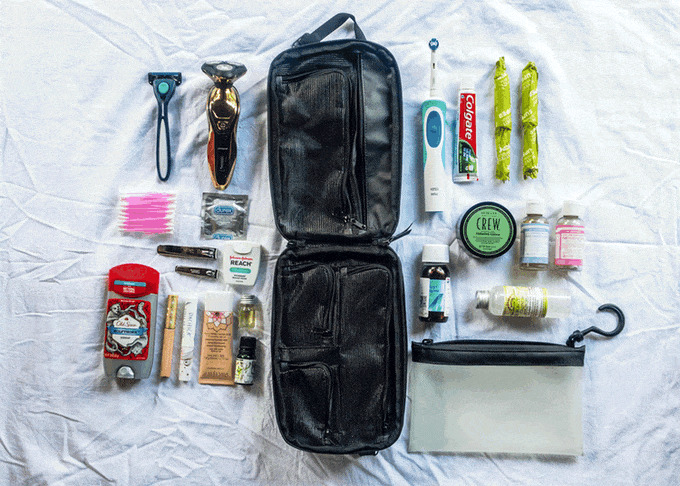 Last year, Gravel’s well-designed toiletry bag was a hit with our readers, and a Kickstarter success story. But if the original didn’t have enough space for all of your travel gear, their bigger Expeditioner bag is now available for preorder. The Expeditioner has every feature that made the original great, like a waterproof exterior, a hanging strap for bathrooms lacking in counter space, pockets that are perfectly sized for common travel items, and a water-resistant compartment for liquids that will keep broken bottles from soaking the rest of your gear. In short, it’s still a fantastic toiletry bag! The big difference is that the Expeditioner is, well, bigger. It has enough space in its toothbrush compartment for a full-sized electric brush like the Sonicare Essence, all of its major compartments can hold more items, and it even includes a pocket on the back that can hold an included, TSA friendly clear pouch. The $54 super earlybird and $59 earlybird reward tiers have been sold out since last week, but they just opened both back up for a limited time, so get your preorders in while you can to save on the $69 MSRP. If you want the smaller, original bag (now called The Explorer), you can add it to your Expeditioner preorder by adding $44 to your pledge. It’s been slightly updated (and slightly enlarged) from the original Gravel bag, but it’s still far smaller than the Expeditioner. We sort through the noise of Kickstarter to find you preorder discounts worth taking advantage of. Someone on our team has tested a prototype (or final version) of every Kickstarter we cover, unless otherwise noted. If your pets don’t like being groomed with a normal brush, you might be able to trick them into it with this grooming glove. You can brush away loose hairs and give them a nice massage at the same time. Plus, it’s washable, reusable, and might save you some time vacuuming time. Don’t let the product photo fool you - this listing is just for one glove. But if you enter promo code EUW8WHK7 at checkout, you’ll pay just $6. A first aid kit is one of those things you should probably keep in your glove box, and you should definitely have at home, and at $15 for 299 pieces, there’s no excuse not to be prepared for minor accidents. For a limited time, Amazon’s offering big savings on a bunch of matcha varieties from its Wickedly Prime lineup. We posted this deal a few weeks ago, and the products are even cheaper now, though they’ve all become add-on items. Let all your troubles drift away with this Intex Lounge chair. It’s just $5 today as an Add-On item, which means it’ll ship for free with a larger order. So stock on some dog food or tools and dive in. Without any wiring to futz with, these solar-powered, motion-sensing spotlights are the easiest way to illuminate your front porch or lawn, and you can get two of them for just $8 today with promo code AZ9BZNMZ. It’s not like having a belt that doesn’t fit right is a huge issue; it’s definitely a personal problem. But it is really, really annoying. Ratchet belts are the answer to that small, but not insignificant problem, and Amazon has a bunch from SlideBelts discounted to just $29-$30 each, today only. Made from vegan leather, you can choose from 18 different colors and buckle finishes. Most rain boots aren’t made for comfort and style; they’re made to keep your feet dry. But Alice + Whittles goes a step further by creating slim, good-looking boots that feel light and comfortable on your feet. And right now, they’re marking down eight different colorways of their minimalist ankle boot to under $100, so maybe it’s time to rethink your thunderstorm attire. Update: Walmart has matched this price, but also has a $25 mail-in rebate available! Thanks for the tip, mischlep. Okay, I’m no luddite, but this is a lot. But in any event, this is the first time it’s ever been under $100, and $95 is a great price for a high-end electric brush. The Fitbit Charge 2 is one of the best fitness trackers you can buy, and the heart rate model is down to $120 right now on Amazon for Father’s Day, about $30 less than usual. Some models with special edition wristbands are $150, but those are down from $180. Dad want a full-on smart watch? The Fitbit Ionic is also down to $250 in a variety of colors. Foam rollers are great for soothing aching muscles, and $11 gets you a hollow core and solid core roller today. One even nests inside the other for easy storage and carrying. I’d say that’s a better use of your money than 15 minutes at a massage parlor. If you don’t know about Dallas-based Breda, you need to. The watch brand creates minimalist, easy-to-wear styles of watches that aren’t overworked or over priced. And we’ve got an exclusive discount in time for Father’s Day, or a great graduation gift. Use the code 35DADGRAD and grab any colorway of their Visser, Rand, Valor, or Belmont styles for 35% off. I dare say, even a footman could afford to buy the complete Downton Abbey Blu-ray for $55. Cheerio! It’s temporarily sold out, but you can still order this 20-film Clint Eastwood Blu-ray collection for $55, which includes 20 films (including a number of true classics), plus two documentaries. Did you get a chance to play the Mario Tennis Aces online demo this weekend? I really enjoyed it, and not to brag, but I won two tournaments. If you enjoyed it enough to buy the full game when it comes out later this month, you can preorder on Amazon right now to save $12 with Prime. I realize paying $50 for Skyrim in the year 2018 is a bit absurd, but that’s within about $1 of the best price we’ve ever seen on the Nintendo Switch version. It’s Skyrim in your pocket, how cool is that! The clock has reset on Humble Monthly, and this month’s early access games are WWII strategy sim Hearts of Iron IV, the offspring of Minecraft and Zelda Portal Knights, and the hilarious Blackwake. As always, Humble Monthly is only $12 per month (or less if you prepay for longer time periods), and includes a cache of PC games each month, plus 10% off in the Humble Store, and extra benefits on certain Humble Bundles. The best part? Even if you cancel your membership, every game you add to your Steam library is yours to keep. So if you sign up now, you’ll get those three games immediately, plus a bunch of others when the month unlocks in early July, all for $12. Starting on today (yes, I know it’s not actually June yet), you’ll get access to five new games, including Tumblestone, The Banner Saga 1 and 2, and Strafe. All you have to do is connect your Prime and Twitch accounts here, then click the loot icon on the top of your Twitch homepage to find all of the freebies. Once you add them to your library, they’re yours to keep, even if you cancel your Prime membership further down the road.